The most dreaded of all days is right around the corner. Evil lurks behind every curtain. Ghosts from the past appear out of nowhere. You just can't seem to escape the dreaded horror, no matter where you go. Television, radio, the newspaper... it's everywhere! That's right... Election Day 2014 is almost here! Here in North Carolina, there's a heated Senate race between Democrat Kay Hagan and Republican Thom Tillis. Obviously, both of these candidates are hollow 'yes men' for their respective party. They have nothing to offer our democracy and the citizens of North Carolina will clearly lose no matter who the victor is. Yet, I've taken notice of a particular set of online ads that I've heard and watched over the past twenty-four hours. They concern third party Libertarian candidate Sean Haugh. Of course, I'll be voting for Haugh simply because he's the only other candidate on the ballot. I don't trust anyone with a [D] or an [R] behind their name. But... the motivations behind this particular ad campaign surrounding Haugh are troubling. Here, watch for yourself. Basically, this ad is linking stereotypical stoners to Haugh. I've seen multiple versions of this ad in various places around the internet. "More Weed" and "Less War" they chant, invoking the hippie aesthetic of the 1960's and 1970's. There's no real content to the ads - just mindless jargon that conservatives would clearly blast as irresponsible and amoral. Sean Haugh, whom will most certainly not win the election, is a very average fellow. Haugh is from Durham, drives a 2005 Kia Spectrum and delivers pizza for a living (he's retired from his professional life as a former head of the Libertarian Party). His platform includes ideas like ending the War on Drugs and ceasing endless funding to other countries, such as Israel and Egypt. Fairly logical concepts, if you ask me. Currently, most polls place state-wide support for Haugh between five and seven percent. While that's not a lot, it's definitely enough to decide the election for Hagan or Tillis. Here's the trippy part to this story - Haugh has no connection to this ad campaign. The Libertarian Party did not fund production, either. Who paid for these ads, you're surely asking yourself? Well, the answer can be found in small print at the end of the commercial. If you look closely, you'll see that a group called the "American Future Fund" created the ad. Just what is the "American Future Fund"? 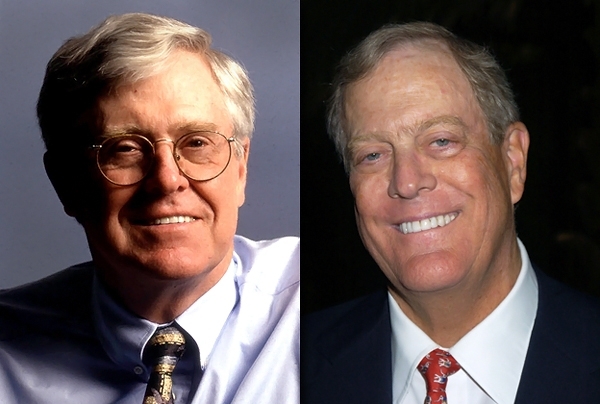 Surprise - the Koch Brothers! The American Future Fund is a 501 (c) (4) tax-exempt non-profit organization established during Mitt Romney's campaign for President in 2007 and 2008. It's a wing of the Center to Protect Patient Rights, a directly funded Koch Brothers group that dumps millions into our American political process. How insulting that the Kochs and their cronies want to alter the outcome of the NC Senate race by trying to sway on-the-fence conservatives to Thom Tillis? The motivation behind these ads is ingenious and dastardly. The race between Kagan and Tillis is extremely close, so they know Haugh will split support from conservatives and ultimately hand Hagan the win. By labeling Haugh as a weed lovin' hippy, they hope middle of the road conservatives will vote for Tillis. Instead of presenting the facts about the candidates, they decided hippies were the way to go. I can imagine the development meeting for this ad campaign now. "So... we've got to obliterate that Kay Hagan." "Yeah... damn limp-wristed Libertarians are eating up too much of the conservative pie. Gonna kill Tillis, I say." *Snort* "We've got to paint that pansy Haugh as a real loser. That'll bring everyone back into the fold." "I've got it... hippies. We hate those bastards as much as anyone. Paint the bum as a pot-smoking idiot." Whether you support Hagan, Tillis or Haugh, this type of campaigning isn't the way to go about it. Using fear and treachery to incite negative feelings in voters isn't just dishonest... it's downright disrespectful. If those whom pour millions into elections look at the American public with such disrespect, shouldn't we be terribly worried about why they're spending all that money to begin with?